An update for the popular iPhone game Pok?mon Go was released on Tuesday, restricting Google account permissions to the bare minimum needed for the app to function. The Pok?mon Go version 1.0.1 not only resolves the complaints about unrestricted Google account access directed at developer Niantic, but also fixes some other issues with the game. Changes include the removal of repeated user and password credentials after a force logout, stability to the Pok?mon Trainer Club account login process, and fixes for unspecified issues causing crashes. Pok?mon Go is free, and still requires iOS 8.0 or greater, and a minimum of 193 megabytes of storage space. I've noticed this before on this site, but certain special characters do not show up for me at all. I'm guessing that it's supposed to be an "e" with the small apostrophe or whatever it's called above it. I am on the newest Safari. Although the main server and the forum server both support charset UTF-8, which is probably the Apache webserver default anyway, I suspect it is the auto export conversion function they use to send the story from the main server to the forum server that only supports the ASCII character set. I'm confused. Does Google still own and profit off Niantic? Weasel as much information as possible, the dial it back if they're called out on it. Never trust an advertising company. It does. You can use a Niantic account, a Facebook account, a Google account, etc. Typical media spin making it look like it's Google only. Google is a Niantic investor. The reason for the Google sign-in tho is because it uses Google maps doesn't' it? Could be wrong as I don't personally use the app. It's no longer a Google company. It uses Google Maps, but that's not why it offers the Google login. 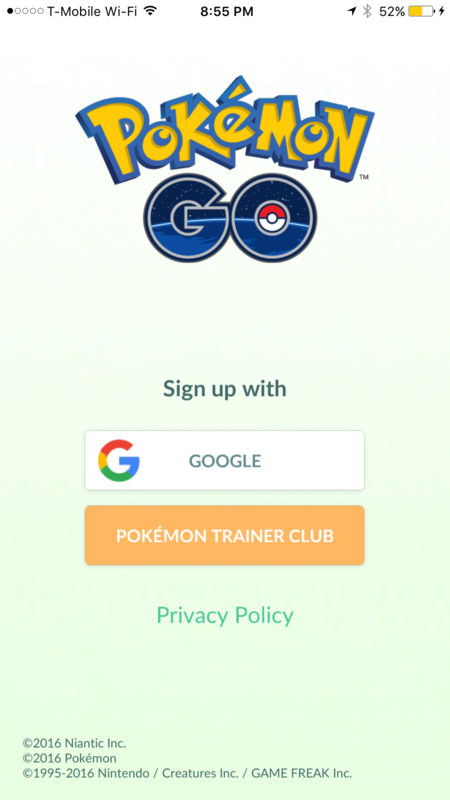 We've addressed that you can use a Niantic-supplied account (when the servers allow signup) or a Google account to play the game in other articles on the topic. what I do not understand is everyone knows Google is collecting everything they can about their users and people are perfectly fine with giving up their personal privacy for a free email account and they are upset a game maybe also looking at their stuff. Really, if you do not want people looking at your stuff stop using a google account. I highly doubt I will even play this game, but can you use the game without having an Google account, can you just create a user account for the game. You can use a Google account or a Pokémon Trainer Club (club.pokemon.com) account. However, the servers for the latter are hammered and you can't sign up at this time. You don't understand the problem. The EULA gave the developer full READ and WRITE access to user's email, documents, etc., everything related to Google. They can access your account, read, write, and delete emails and documents. Even Google does not do that to their own users. By entering your name and password, you granted the developer full access to your account. Google does not have that type of access. Most people don't know to create a dummy Google account, and millions have played the game signing in with their Google account. So the damage is already done. Anyone using a public forum has given up some level of privacy. So what you should really say is that people should stop using the Internet completely if they do not want some level of their information out there. So Google doesn't do this to its own users, but makes APIs available so third parties can do it? exactly, People have not clue what Google is doing, at not time is Google protecting your private information, Even people who have not signed over their privacy rights to Google to get a free email account are having their emails read. Today any time I do business with someone who is using a gmail account I tell them I will not do business with them until the get real email account.